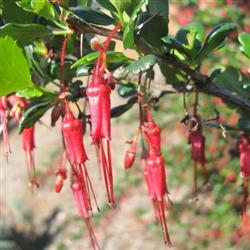 The Fuschia flowering Gooseberry has one of the best displays of flowers in California's winter season and is an important bird habitat shrub. It is deciduous in Southern California, losing its leaves in later summer. In winter the foliage returns along with deep red, fuchsia-like flowers. This shrub is a favorite of hummingbirds and provides shelter that is defended dearly by the birds. The flowers produce a dramatic show in winter providing nectar when little else is flowering, and then setting to fragrant, red berries in the late Spring. The flowers are protected by thorny branches. Height ranges from 4-10' and spread reaches 7' at maturity.